Bassist Harvie S and Guitarist Vic Juris team up to perform original compositions and jazz standards. They further explain the call and response dynamic that creates an optimum musical partnership. Harvie S addresses the challenges of an innovative and well balanced duo performance. He demonstrates ways that the bass supports and leads with affirmative and demonstrative ease. This Master Class articulates the distinctions between duo and various other settings, and is valuable to guitarists and bassists alike. The concepts revealed will enhance any duo performance. 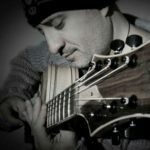 Harvie S shares his personal approaches to preferred guitar accompaniement and his unique approach to phrasing melodies and soloing. This class is a must for all guitarists. Vic and Harvie are true masters and show the many possibilities that exist within the duo context. They address issues of programming; contrast, variety comping, listening and also the history of the guitar/bass duo as well as other duos. And they play excellent original music. Don’t miss this one!